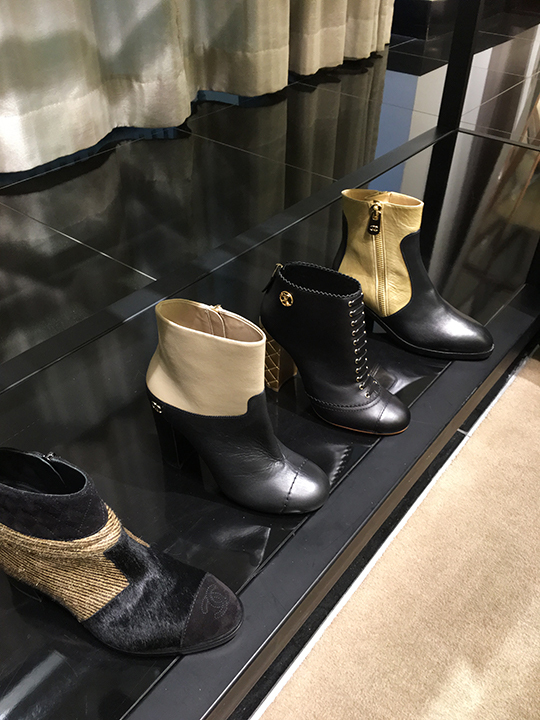 With pre-sale well underway at Chanel boutiques, luxury department stores are also getting in on the action with discounts on Chanel's Pre-Fall & Fall '15 collections. 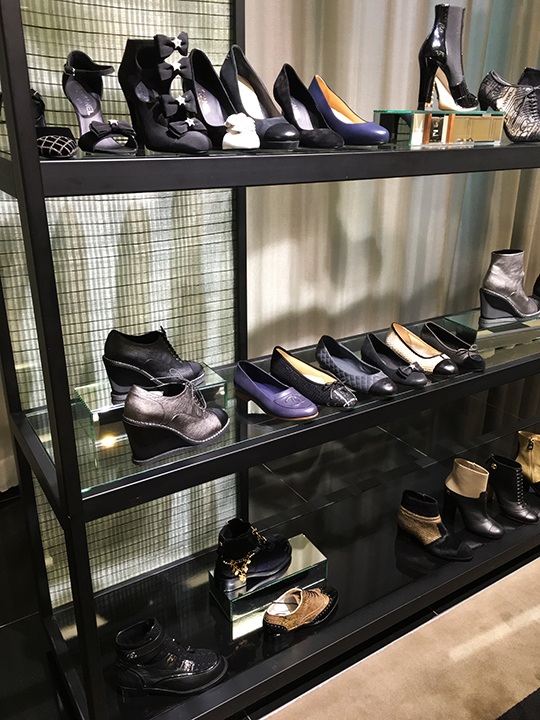 I went on a little shoe shopping spree yesterday afternoon to indulge myself and decided to write a report on what I found at Bergdorf, Barneys, and Bloomingdale's. So, here are the deets on the double C at NYC's triple Bs. 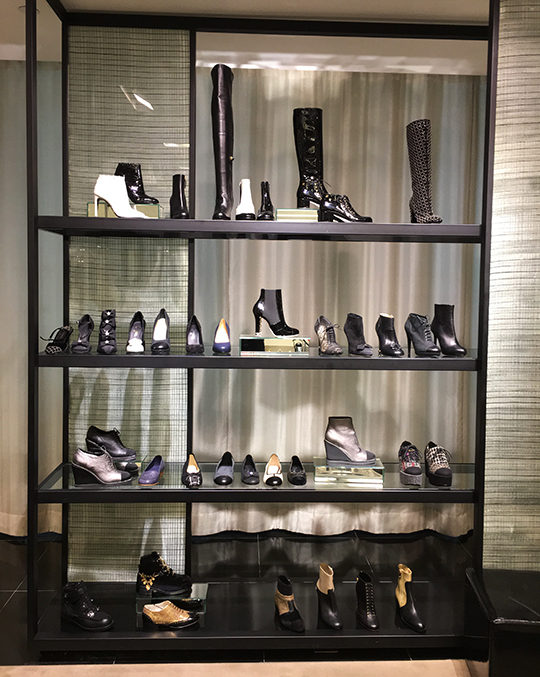 I started my retail therapy at the Bergdorf Goodman shoe salon and was disappointed to find their pre-sale items not out on display. Instead, a sales associate showed me photos of the shoes that will be marked down 30% and stated that the official sale starts today, December 10th. I should mention the 30% discount is the lowest among the three. 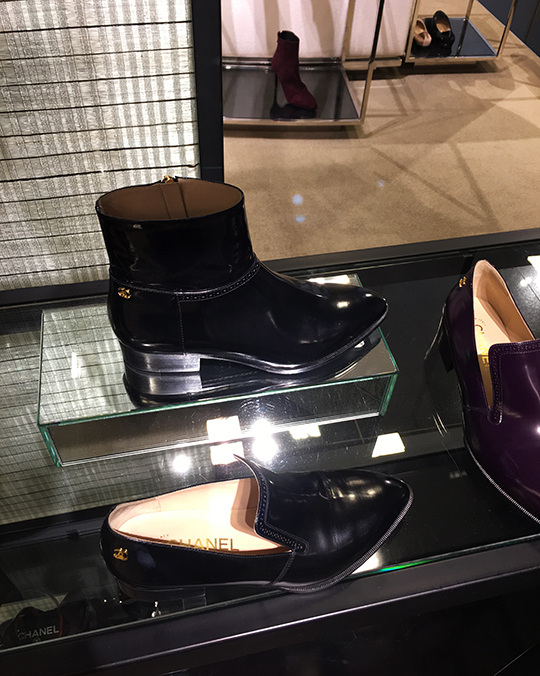 My next stop was at Barneys' 5th floor shoe department. 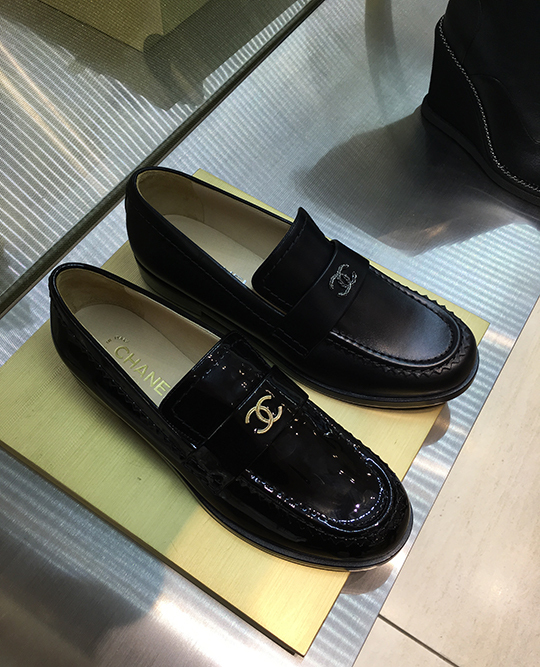 I found pre-sale was in progress and their discounted Chanel shoes were showcased on several shelves. A sales associate informed me items from Pre-Fall '15 & Fall '15 collections were marked down 40% and shoppers will be allowed to take home their purchases tomorrow, December 11th. 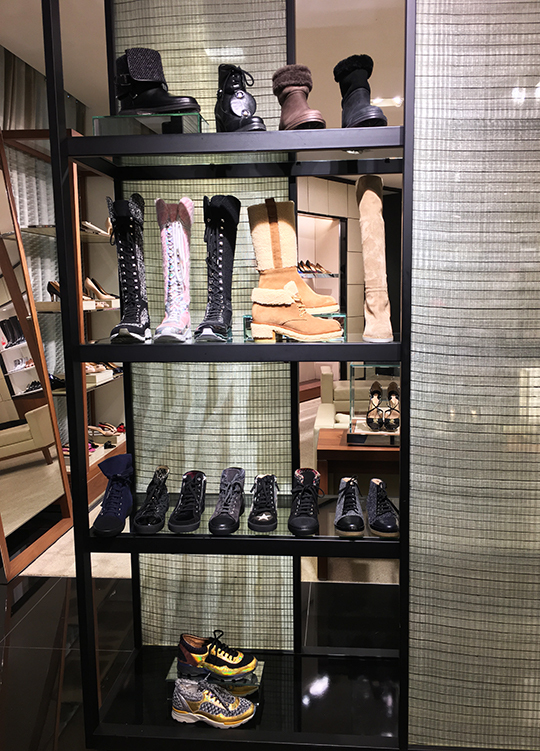 While browsing, I came across a nice assortment of flats, sandals, and boots. 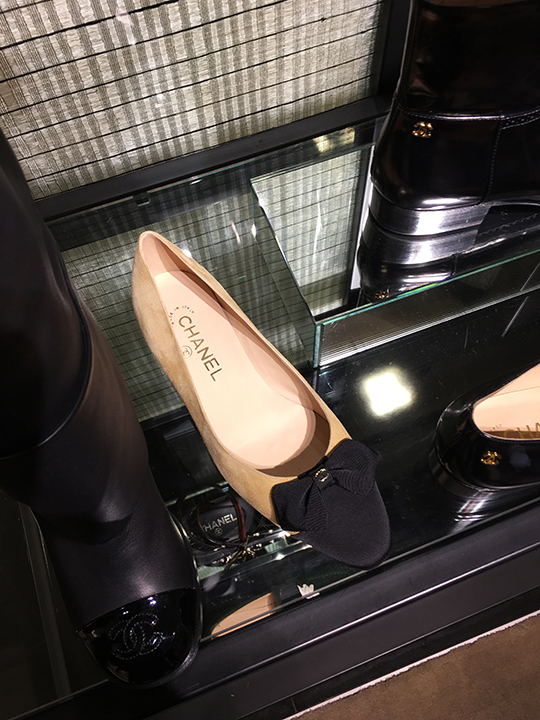 Chanel's cap-toe ballerina flats were available in lace and priced $479 (12th photo below). As for other designs, a pair of black bow sandals were $510 (11th photo below), round toe tall boots were $990 (13th photo below), calfskin double-zip booties were $795 (14th photo below), gladiator-style chain sandals were $630 (15th photo below), and CC logo patent loafers were $465 (last photo). 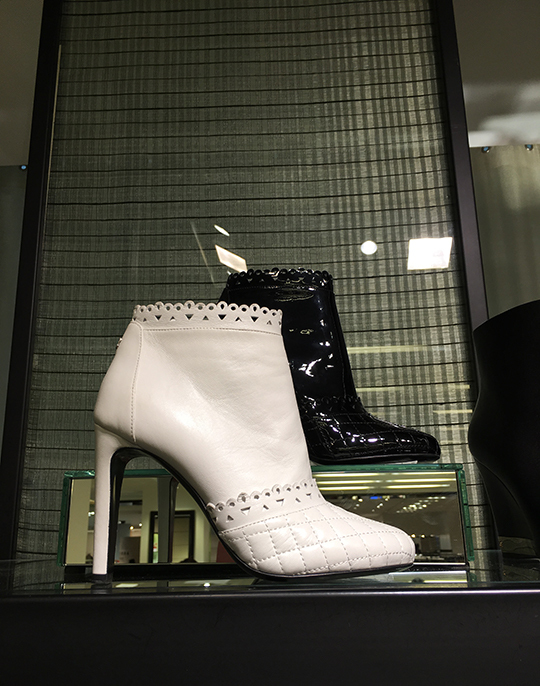 My last stop was at Bloomingdale's. On the 4th floor, I found pre-sale ongoing with discounts of 40% off being offered. 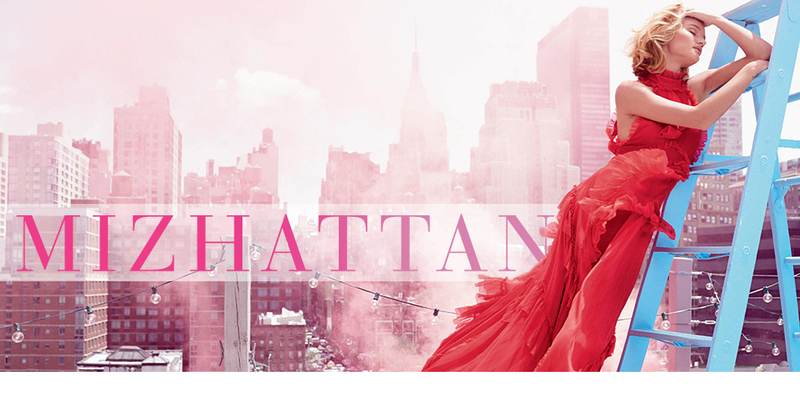 But unlike Bergdorf or Barneys, shoppers will have to wait until Saturday, December 12th to take home their purchases. 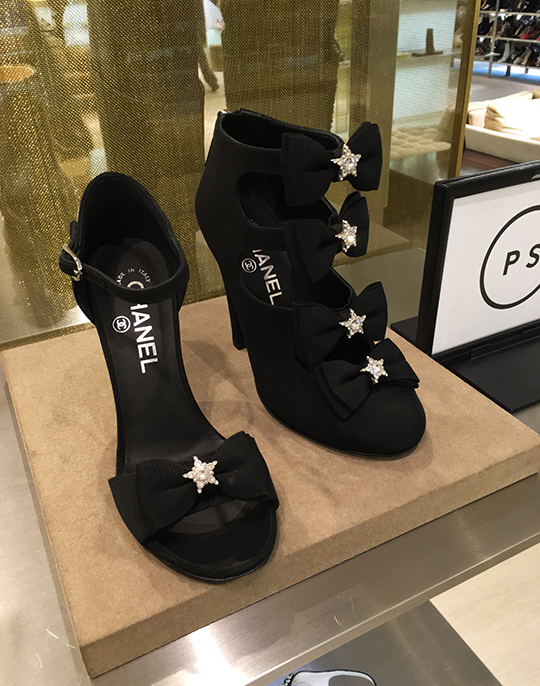 Some of the items worth mentioning were beige suede bow flats for $477 (3rd photo below), black and white camellia pumps for $570 (4th photo below), laser-cut lace booties for $690 (5th photo below), black and beige round toe booties for $795 (6th photo below), black dandy loafers for $510 (7th photo below), and quilted heel lace-up booties for $735. 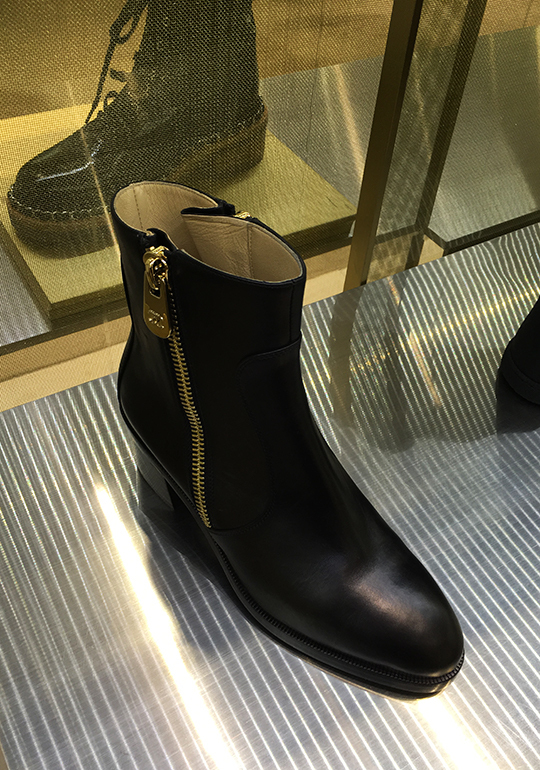 As I mentioned several times, Chanel is also currently holding pre-sale at all their boutique locations. The transition to the official public sale will be on Friday, December 11th. Although you do not need an actual invitation to shop, it can feel a bit daunting for some people when it comes to approaching snooty sales associates. If this is the case for you, I highly suggest spending your hard-earned money at one of these three department stores as most SAs there are very friendly and eager to help. Shopping at all three department stores yesterday was such a pleasurable experience for me and I hope the same for my fellow Mizhattanites. Happy shopping! Is presale only for shoes? 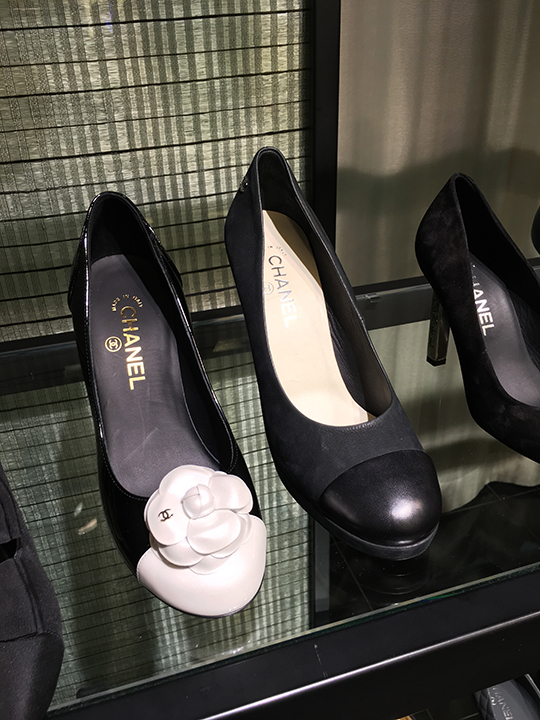 No, Chanel is having pre-sale for RTW and shoes at department stores and boutiques. 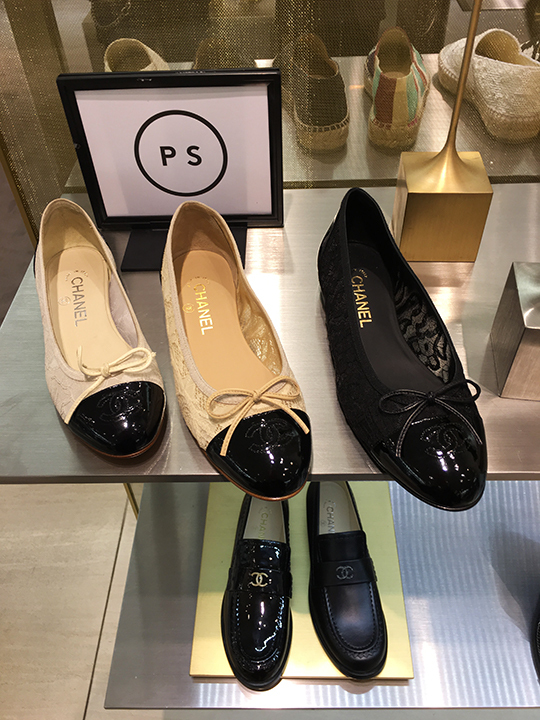 Do you know anything about Nordstrom's Chanel Sale? Sorry, I haven't had the chance to look into Nordstrom's deals. I notice that the extremely popular slingback style with the beige body and black toe is not among the sale shoes? Yes, they sold like hotcakes and therefore aren't included. Hello Miz, in your second photo after the post, the middle quilted 2 tone flat- was this at Barneys? Do you know what the style is/price? Thanks so much! 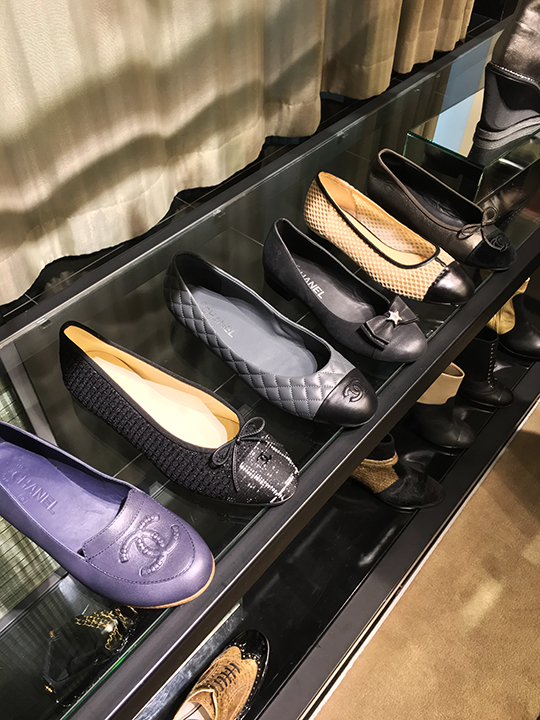 Those quilted cap toe flats are at Bloomingdales. I didn't take a look at the price for that one. Hi Miz, do you know if accessories go on sale at all? A very very limited selection of jewelry does go on sale from time to time. Thank you! 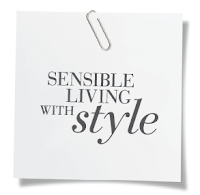 What would you suggest- try my luck in a department store or go to boutique? Oh, that's a difficult question as jewelry is very hard to come by. I would start off at their boutique and then ask a helpful SA to track down some for you.